Today I’m going to take a closer look at one of the latest Golden Stage projects – Tree7. The project has been already up and running for more than 30 days. It has joined our Golden Stage program on 22nd of March, and I have made a $400 reinvestment. So, let’s see what’s going to happen with it in the following weeks. In the meanwhile, I want to dig a little bit deeper into the investment plans and behind the scene facts, which I will explain in the following paragraphs. The story of Tree7 seems simple, yet logical. Their brand name has roots in their main business, which is related to harvesting forests in Finland. In fact, I don’t see too many HYIPS saying that their main profit source is wood. Moreover, they have also taken photographs of the company registration documents. 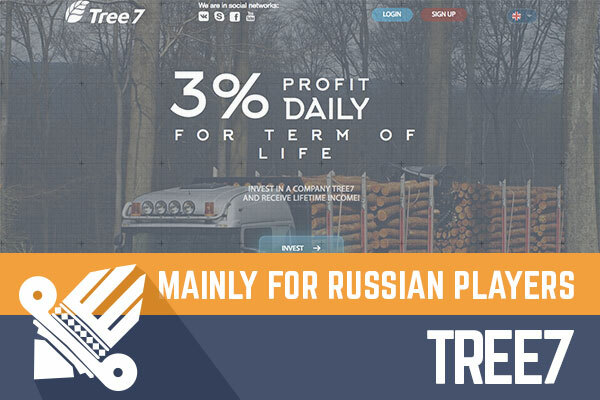 The information about TREE7 LIMITED is also available in the UK company register. However, the strange fact is that company claims that “we have been servicing our clients since 1997”, but the TREE7 LIMITED has been registered only last year. Of course, it might be the diversification of businesses and cash flows. The website has covered the group of 8 languages, which is great. Translations require extra efforts and investment, which gives me an extra feeling of credibility. I’m not trying to praise the authors, but it does look way better than a Google Translate button implemented on the website. No offense, but robots are still not the best translators these days. From my previous experience, I must admit that it’s a custom-made web design layout, but behind it is H-script, which is another important aspect. Although this may be true, let’s not get too excited about it. As we know, all HYIP authors are willing to make a profit, and I believe this is not the exception. So far everything looks great, but I still have a question – where is the catch! On the other hand, there is also some proof of publicly available communication and online support on a Public group on Facebook. They make announcements about investments and withdrawals. Of course, all information is discrete, and there are no names displayed. It can also be just some random numbers taken out of nowhere. I assume that one of their primary target audiences is Russian speaking customers since they even created an account in Vkontakte (large social network for Russian-speaking audience) where they have somehow accumulated around 260 followers and communication is very like facebook group messages – investment accepted, money withdrawn. There is also a way to communicate through Skype. Still nothing unusual. Of course, the thing that everyone would like to know is - how much can you make here? 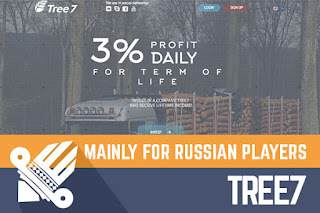 Their investment plans seem very simple, and it is – 3% a day for an unlimited term, deposit locked in and a minimum investment of 10$. I must admit that lately, I have seen such plans with a 3% rate and lifelong term. However, the downside is that such programs might be unpredictable and you can’t calculate how many actual rounds a program has already made and how long it theoretically can last. Of course, the good thing is that initial deposit is being kept, which often is a guarantee that there will not be 100 guys trying to take out of the program tons of money and cause a collapse. However, these are my assumptions based on the comparison with other similar programs. Obviously, Tree7 seems way better than many other projects I have seen in the recent past. However, it doesn't mean anything due to the unpredictable nature of the HYIP’s. It has a real company behind it which can be checked on the registrar, but the project already has been online for long – more than 30 days. In my opinion, it’s very hard to predict when it will stop earning. No doubt, first guys that made their investments a month ago are happy, but what’s going to happen if you will invest today? It’s 100% up to you! Always estimate the risk and make only smart investments – don’t invest more than you can afford to lose! Investment plans: 3% daily for an unlimited term, initial deposit locked in forever. Earn free satoshis over at DailyFreeBits. Up to 1,000 sat. every 60 minutes.